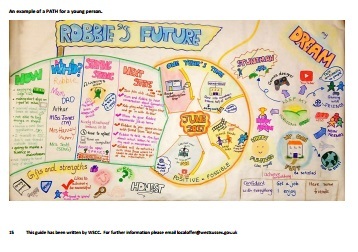 West Sussex County Council and Inclusive Solutions have been working together to up-skill staff and parent carers on a range of Person Centred Planning processes. Person Centered Planning will enable a structured conversation to be held that will discover what is most important to a person (or group) and agree the opportunities and support required to give them the best chance of experiencing this. MAPs and PATHs are two visual Person Centred Planning processes that can be used with individuals, groups and organisations. A PCP facilitators guide has been written to provide step by step information on how to facilitate a PATH or MAP session, download this here. The PATH process is also accompanied by a series of training film clips below. 5. Who do we need to enrol? “The tool helps us to have a meaningful conversation rather than just call a meeting because it’s part of a statutory cycle.” SENCO - “It is the first time our son is part of the Annual Review and it is great to have him with us participating and saying what he wants.” Parent - “Using these PCP approaches helped us to make the most effective use of the resource we had available. Comparing PATHs has helped us to identify common views and themes to inform commissioning.” Organisation - “My PATH makes me very happy. It was really good and everyone made lots of effort all of me – it makes me want to try my best and learn how to do it all.” Young Person “It helped us feel that we work together as a team, and see how all our actions contribute to positive outcomes” Shared Parent & Primary SENCO view - “The PATH is a visual and personal representation of the child’s and families dreams for their future and sets out the support they need to achieve these outcomes.” Educational Psychologist - “It was a really positive and creative experience which we liked. We responded well to this new approach. We weren’t bogged down with what XXXX can’t do, we realised what he could do.” Parent - “You start with your dreams and think about what you want to happen this time next year and then it helps you, as the picture is in front of you, to think you can actually do this and how to do it. You can take part in it and see you can do it. It’s a very different approach to what has been done before as you only used to talk about the things she can’t do”. Parent - “The fact that everyone was there was useful, as we all have different opinions. Everything was together; if I talked to you on my own I wouldn’t of thought of all the things I thought of. Having the views of how people see her in different situations jogs your memory.” Parent view of pre-school child.